It’s time to pick up your favourite kits and wear your colours with pride, because April 27th is Football Shirt Friday. You need to stop scrolling through Facebook, binge-watching Netflix or whatever else you might be doing, because we need your full attention please. Football Shirt Friday is here. This is the chance for people to show off their favourite footie shirts in the office for a full day, as they finally get to ignore that annoying dress code and have a bit of fun. Better yet, it’s all for an absolutely fantastic cause. Now entering it’s 6th year, Football Shirt Friday is a fantastic day which has grown in popularity year-on-year. What Is Football Shirt Friday? Football Shirt Friday is supported by Cancer Research and the Bobby Moore Fund, as they urge everyone to pull on their favourite football shirts for one day. All proceeds go towards bowel cancer research, with the charities asking you to donate £5 to get involved with the day. There are some big names involved with it too, with David Seaman, Ledley King and Robbie Savage all featuring heavily throughout this year's campaign. When Is Football Shirt Friday? This year, Football Shirt Friday is today on April 27th, which ties in with Bowel Cancer Awareness Month. All you have to do to get involved with Football Shirt Friday is sign up to the Bobby Moore Squad and claim your free starter pack. You can then donate £5 by texting “SHIRT” to 70200 or by paying online. Then that’s it- you’re all set to wear your favourite football shirt on the 27th! You can also do your part to help raise awareness too, by snapping a selfie in your shirt and then sharing it with #FootballShirtFriday! This will help create a social media buzz, increase donations and ultimately turn the day into a huge success. Oh, and you can also follow the hashtag to have a nosey at the awesome shirts other people are wearing! You can find out even more by visiting the Cancer Research website. Which Football Shirts Should I Wear? Now this is a tricky one. Many people will undoubtedly be showing off their own club’s latest strip, since this is what they already have in their wardrobe - and there’s certainly nothing wrong with that. However, you just can’t beat showing off a colourful retro number to really make the most of the day. 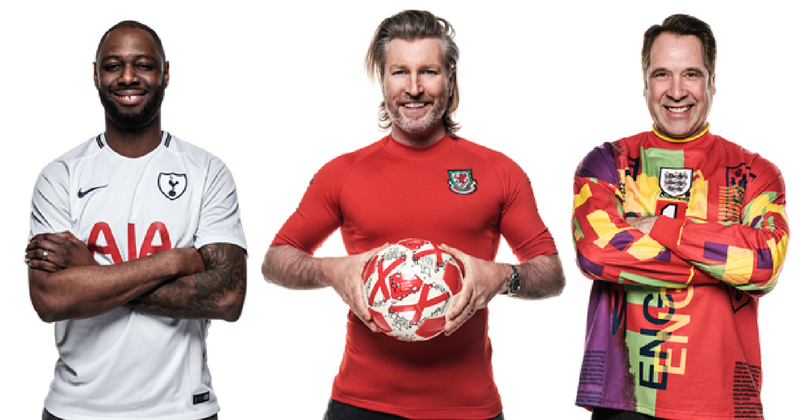 David Seaman has been looking resplendent in his old Euro ’96 goalkeeper jersey, while Robbie Savage has been posing in an old-school Wales kit. This sense of flamboyance and colour really helps capture the fun of the day, so you might want to think about wearing something a little bit different. But, of course, this is entirely up to you, and it’s all about you wearing your favourite football shirt for a great cause. The only question is: which football shirt is right for you? Where Can I Find My Favourite Shirts? Even though today is the day, it's never too late for a bit of shopping and bargain-hunting with FOOTY.COM. You can browse our selection to find your favourite shirt, then simply have a look at where you can find the best prices and click straight through to claim the deal! We’ve found you the lowest prices on retro and modern football kits, providing everything you need to gear up for future Football Shirt Fridays!